Chemistry: Core Concepts continues the substantial commitment of Wiley to chemistry education in Australia and New Zealand. The text has been developed by a group of leading chemistry educators for students entering university with little or no background in chemistry. It presents the core concepts in chemistry at a level that will enable students to build confidence and achieve success in their university chemistry studies in discipline areas such as the applied sciences, health sciences and engineering. All the fundamentals are covered - including the use of chemistry language, symbols and molecular structures - and it also develops the requisite quantitative skills. 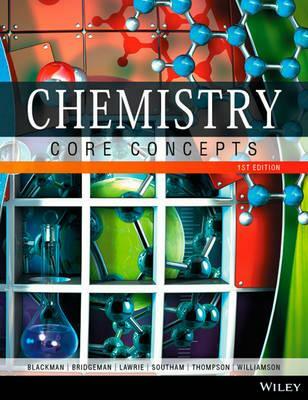 Chemistry: Core Concepts has been adapted from Wiley’s market leading Chemistry text by Blackman, Bottle, Schmid, Mocerino and Wille. Many of the strengths of this book have been retained, however the narrative has been abridged and simplified to make it more accessible for foundation students. A hallmark feature of the core text is the stepped demonstration problems, which model a consistent problem-solving methodology designed to encourage students to break complex tasks down into their constituent parts. Another key pedagogical element of the text is the Chemical Connections feature, which brings additional meaning to the study of chemistry by highlighting the connections between the chemical concepts within the chapter and local applications of that chemistry in the world around us. Importantly, Chemistry: Core Concepts was envisaged as a print/digital product, where the narrative in the text is designed to be rendered as an interactive journey through a media-enhanced E-Text, providing students with the opportunity to view chemical reactions as movies, demonstration problems as animations and end-of-chapter questions are presented as online revision quizzes that provide instant feedback and progress reports. The digital version of the text will be delivered in the ground-breaking WileyPLUS Learning Space framework, an exciting new teaching and learning environment that provides a personalised learning experience for students and transforms courses into a vibrant, collaborative learning community.